Industrial recycling operations roots in the United States date back to the mid-1800s. The British Empire used to send US recycling companies used cloth; those innovative companies found a way to turn waste into usable products. Today, the recycling industry helps the world reduce resource scarcity, support domestic jobs in the US, and promote sustainability. Recycling operations are highly automated. Baler maintenance is crucial to limiting unnecessary downtime and unnecessary expenses. A key aspect of baler operations for recycling companies is hydraulic pumps and cylinders. If your company has a solid maintenance program but your cylinders are failing twice a year, you should give the hydraulic experts at Perfection Hydraulics a call. The expert technicians in our Cylinder Division can reverse-engineer many hydraulic cylinders used in recycling operations, determine the root cause of the problem, and apply a long-term solution. We never apply a Band-Aid® solution to any hydraulic cylinder/pump repair or rebuild. Anything from a simple repair to a complete rebuild. We can service your pumps, motors, valves, and PTOs. We also have OEM and non-OEM hydraulic replacement components. We specialize in the re-manufacture and new manufacture of mobile and industrial cylinders – large and small. 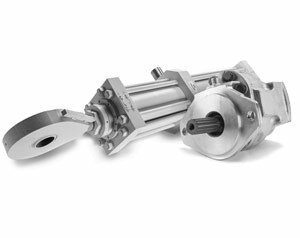 We can custom design and produce cylinders for your specific application. Our production department is dedicated to manufacturing the hydraulic parts we use to build our units. In addition, major OEMs and the US Military also employ us to manufacture the products they use in their equipment. WE HAVE OVER 15,000 PRODUCTS IN STOCK AND READY FOR NEXT DAY DELIVERY. Perfection Hydraulics is the leading source for hydraulic components, at competitive prices. Located in the heart of the Midwest, we serve a multitude of industries worldwide.